For each claim, the team conducted research to determine the veracity of the claim. The results of our investigation are detailed in the following sections. 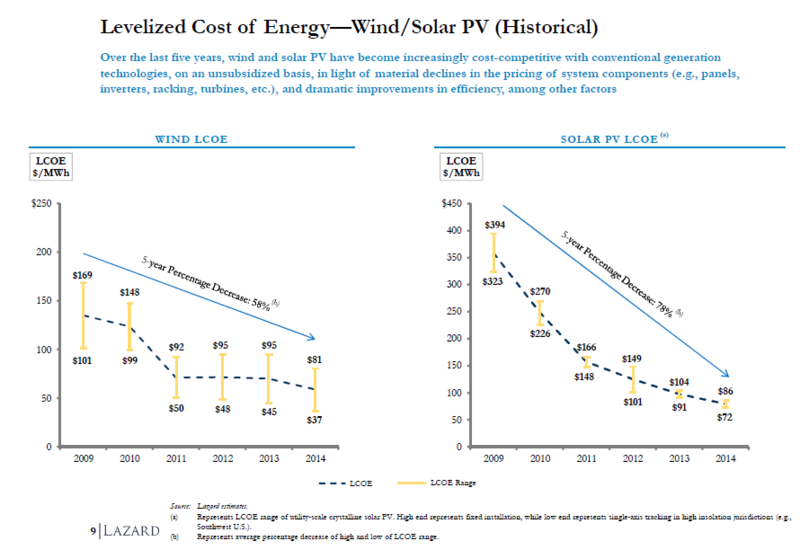 It should be noted that discussion of each claim begins with a description of the specifics of that claim, and that they all cite a figure of 60 GW for total NYS end-use power demand. This number is drawn from Table 1 in the report by Jacobson et al. Currently NYS creates a little under 2000MW of onshore wind power through current wind farms and 0MW of offshore wind power. A list to all operation on-shore wind farms can be found here. The primary question to answer in determining the veracity of this claim is whether there exists sufficient wind speed to generate the specified amount of power. This question can be divided into two sections, on shore and off shore. 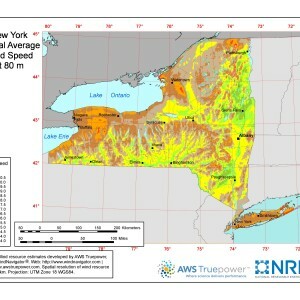 Therefore, in our investigation of on shore wind generation capacity, we needed to answer the following question: Are there at least 800 square miles of open land with average wind speeds of at least 7.75 m/s in NYS? To answer this question, we looked at data and maps produced by the National Renewable Energy Laboratory (NREL). The most important and helpful map was one from November 2010 detailing average on shore wind speeds at a height of 80 meters (see Figure 2), which is a good estimate for the height of a 5 MW turbine. In studying this map, it became clear that there are sufficient locations with wind speeds at or above 7.75 m/s, definitely above 800 square miles. Our group also looked at the availability of the locations, as it would be more difficult to build where there is already development than where the land is open. 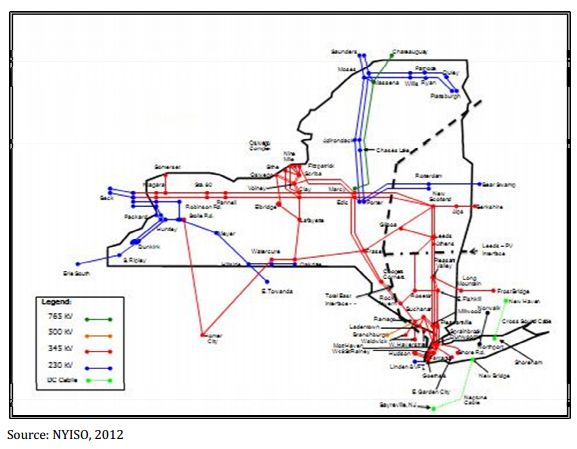 We found that the large high-wind zone between Buffalo and Rochester is already home to several wind farms, though there are no wind generation facilities currently utilizing 5 MW turbines in NYS. Nonetheless, it is the opinion of our research group that there is sufficient land area with sufficient wind speed to accommodate 800 square miles of wind farm coverage. 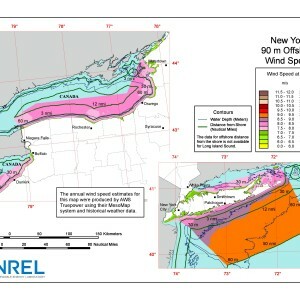 So the question here is simple: Are there at least 2,520 square miles of open sea with average wind speeds of at least 8.5 m/s available to NYS? The map provided by NREL helps to show the feasability since we still have enough space for turbines and most of the area for turbines is already in shallow water. To conclude addressing the claims of the study it is technically feasible to achieve the Jacobson’s claims purely from a numerical point. 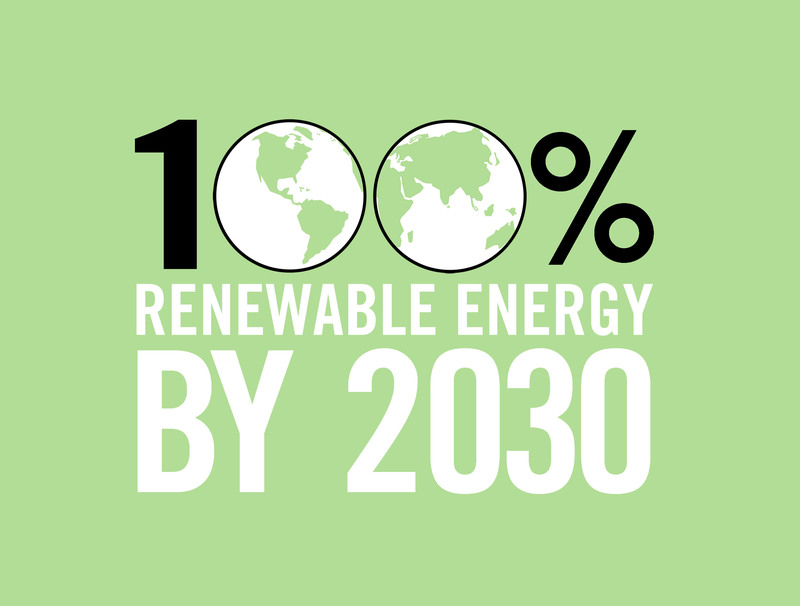 Whether the timetable for 2030 is economically and politically feasible will be addressed now. Can we hit these by 2030? In the United State there are no operational offshore wind farms. The closest thing that we have to a offshore wind farm is the Cape Wind Project and even that has not seen a bit of construction. The timeline for the Cape Wind Project shows that on October 6 2010 after years of environmental review and consultation was a commercial lease to construct a wind farm granted. 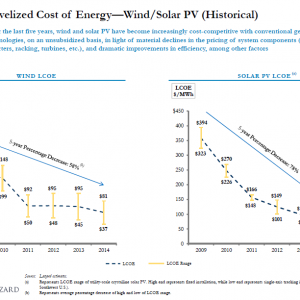 Now in 2015 Cape Wind still has to meed some lease stipulations and is undergoing litigation. Cape Wind is supposed to have a nameplate capacity of 468 MW and is expected to produce on average 174 MW. (Source) If we struggle to even get 1 project in operation it does not seem feasible to have 12,700 off shore turbines powering NYS. With no information within the US we have to look internationally, specifically at Europe which has made great strides with off shore wind. According to the European Wind Energy Association (EWEA) it takes approximately 6 months to create a wind farm with 50 MW nameplate capacity and 2 months to create a wind farm with 10 MW nameplate capacity. (Source) Going of this information creating 63,550 MW worth of turbines in 15 years seems highly unrealistic. The final point I would like to introduce is, do we have the supplies to create these wind turbines? In the United States there is only 1 wind turbine manufacturer. (Source). There are companies associated with construction, R&D, maintenance and operation and various other smaller roles. (Source) At this point even if we can get through the legal process to get approval for wind farms, we would then have to import lots of foreign material which takes time, and additionally construct the turbines which takes some more time. Final conclusions that can be drawn is the meeting the Jacobson claims for 2030 is not feasible under our present political and economic parameters. Thus this would have to be changed. National Wildlife Federation recently issued a report outlining steps needed to be taken to speed up the process of off shore wind (see p. 3) A number of groups are also pushed for the federal Bureau of Ocean Energy Management to reject the proposal for a LNG facility in Pt. Ambrose off of Long Island and instead to allow off shore wind to proceed. The electricity group verifies Jacobson’s claims and finds that there is sufficient solar power available in NYS to meet the electrical demands. Currently 89% of the needed demand is already met by New York State at this time with plans to develop smaller scale hydroelectric plants throughout the rivers and Finger lakes. Current development of hydroelectric includes converting conventional dams to hydroelectric dams as well as upgrading current hydroelectric dams to increase capacity. The primary question to answer in determining the veracity of this claim is whether there exists sufficient potential for hydroelectric generation capacity. Since New York State already meets 89% of the needed demand for 2030 and the current development of hydroelectric dams there is sufficient potential to meet the needs for New York State for hydroelectric generation. 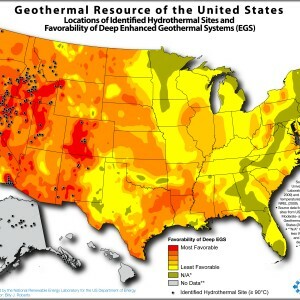 Currently there are no Geothermal plant plans in New York State but there is a large potential for Geothermal energy as shown in the map for potential Geothermal source. There exists sufficient geothermal energy to meet the electrical needs of NYS, but it suffers from the same issues as offshore wind and having the infrastructure ready by 2030 is not feasible. 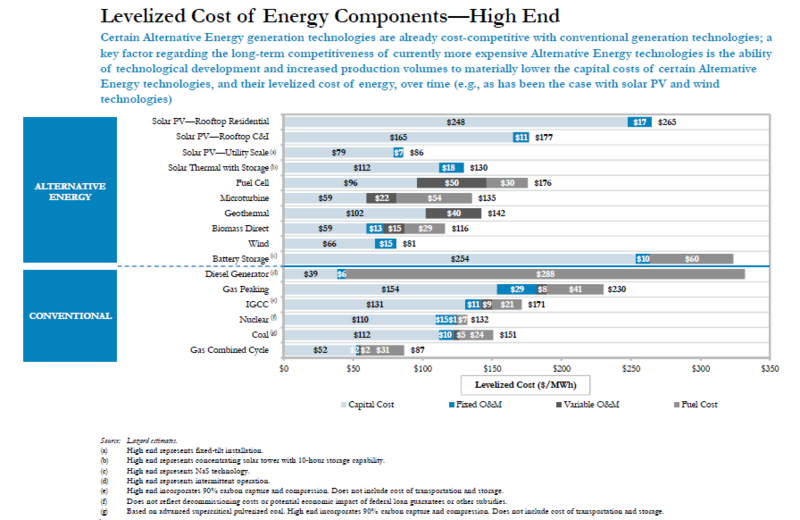 The Lazard Report version 8.0 in 2014 shows the trends of alternative energy cost when compared to fossil fuel cost. 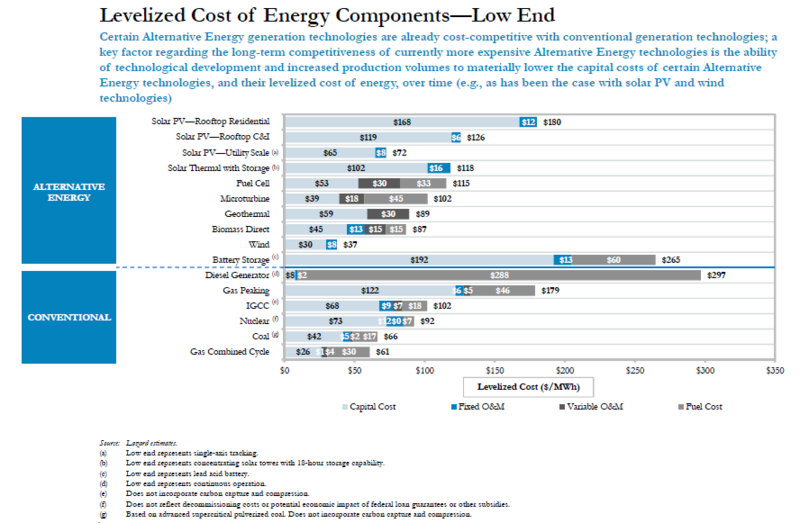 The following diagrams taken from the report summarize the cost comparison between alternative sources and fossil fuel sources. 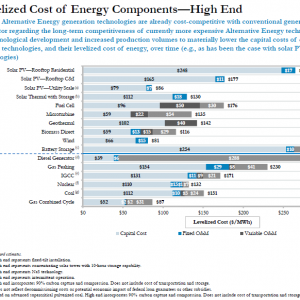 Based upon the Lazard Report version 8.0 in 2014 alternative energy is becoming competitive from a purely cost analysis of the technologies. 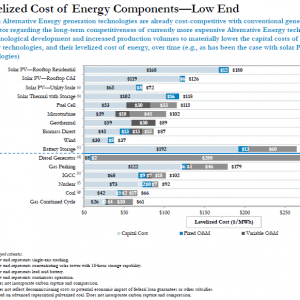 The trends in cost reduction in alternative energy sources shows a promising future for alternative energy sources. Jacobson et al. 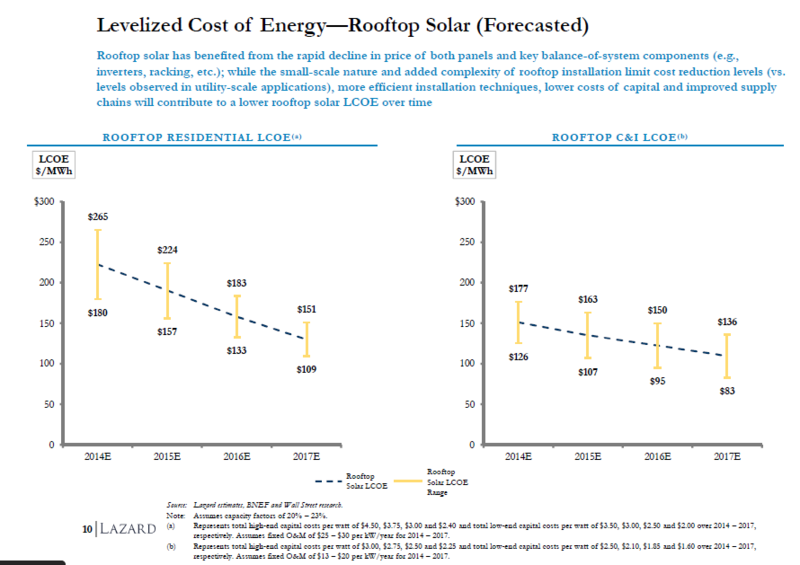 claims in section 13.3 that the current target for energy efficiency is 15% less energy use below forecasted levels by 2015. Given that it is already 2015 the electricity group looked into current and proposed plans for energy efficiency in buildings and electrical transmission and distribution. 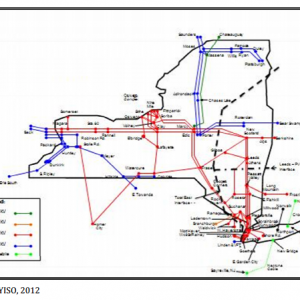 The current New York State Transmission grid supports transmission of high voltage Alternating Current (AC) as shown in the following map. High Voltage Direct Current Transmission (HVDC): HVDC has 25% lower line losses, two to five times the capacity of an AC line at similar voltage, plus the ability to precisely control the flow of power. Flexible AC Transmission Systems (FACTS): FACTS devices are capable of enhancing current energy by 20-40% by stabilizing voltage and making the transmission more reliable. Wide Area Monitoring Systems: Greater monitoring ability by transmission and distribution companies will allow such companies to more closely monitor real time conditions of the lines including thermal monitoring for sagging lines to prevent shorts and to balance loading. These are just a few of the techniques listed in the NEMA document that includes other possible innovations. The Energy Star website has many more ways to make homes more energy efficient along with ways to improve building and plant efficiencies as well (Source). Jacobson et al. 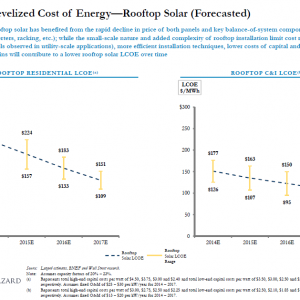 claim of 15% energy efficiency by 2015 is not feasible since it is already 2015 but looking at the innovations in place today and the support by the Energy Star programs and websites and other organizations like NEMA there are clearly many ways for New York State to become more energy efficient in their homes, buildings, plants, and transmission and distribution of electricity.